After an uneventful drive up to Oban, stopping in the Lakes and then at Loch Lomond for a bite to eat, we settled in to the B&B and took a stroll down to the sea front. Since we were last there, a new pub has opened near the ferry terminal, and proved to be a good place to chill out, absorb the atmosphere, some Doom Bar (travelled further north than us) and have a cheap meal. An early night, short pitstop to Tescos and I found myself stifling giggles at the ferry terminal ticket office when a chap next to me said he fancied going to Oban for the day, only to be quizzically informed that he was actually in Oban. He meant Craignure! The crossing was calm but the breeze was a bit chilly to be stood outside, so I watched the seas from the viewing lounge area, spotting a small flock of shearwaters at one point, and quite a few guillemots too. On to the Isle once more, and I couldn't help but smile. 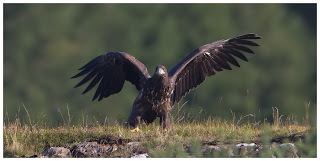 I love the place, and headed straight to Kellan Wood to get my first fix of eagle action. 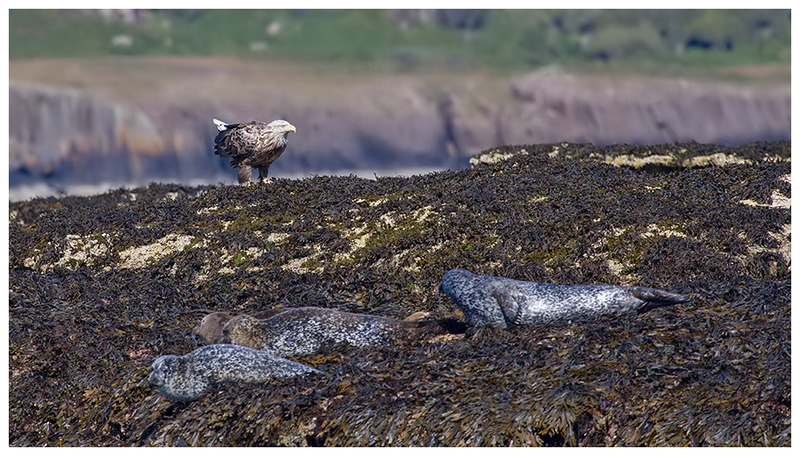 As usual, didn't have to wait long to spot one of the adults sat in the trees, which got the ball rolling for the trip, Then it was time to try to soak up the place, scan Loch Na Keal for anything interesting, and return to childhood by poking around under rocks on the shore for crabs. I didn't actually take any pics at Kellan - I have many already but I thought it would be wise to dig out the camera from under all the shopping bags, just in case. And this proved wise, when after heading elsewhere, I spotted a golden eagle sat on a hillside. 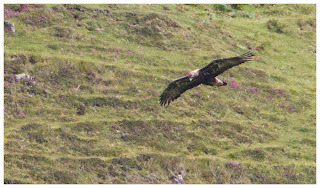 Distant, but it took off and gave super views as it scanned the slopes for a meal. Taking the scenic route around Loch Na Keal, we were starting the descent from the glen (Seilisdeir) between this loch and Loch Scridain, when something large, skimming the tops of the trees in the distance caught my eye. Pulling over, I got the bins on it, and then started a scramble for the gear from the back seat. Another golden eagle, and it was heading up the glen towards us. It seemed to hang in the breeze, taking time to study the ground beneath, whilst remaining fairly high in the skies. Then with almost no effort, it descended and flew past us along the side of the valley, before landing on some rocks. Never close, but wonderful to see and another reminder (not that it was needed) of how special this place can be. I headed out after dropping Dad off at the cottage and emptying the car, for a last look around the loch before the sun set, seeing plenty of stonechats along the way, and a rather vocal buzzard. Up early the next day, to see what I could find near the cottage, would be my routine for the next 2 weeks. As usual, nothing had stayed the same as previous years and I found it difficult to see either hen harriers or otters on my morning trips. The latter had apparently suffered a bad year for road fatalities, and I had noticed a number of new signs around the isle warning drivers to be alert for otters crossing. Plus they had been disturbed too often by over-keen wildlife watchers, and were favouring areas of the lochs that were harder to access for people. 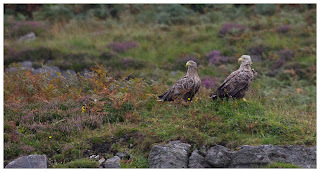 Add to this, the abundance of fish in the lochs, and spotting these characters was a real challenge, even on calm days. I lost count of the times when I saw a ripple, watched and realised it was the wake from a large fish, or saw a seal's head pop up nearby. 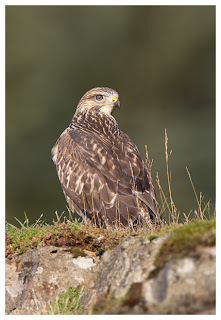 There were still plenty of buzzards around though, some flying off instantly, others content to sit and allow pics to be taken. And there seemed to be stonechats everywhere. 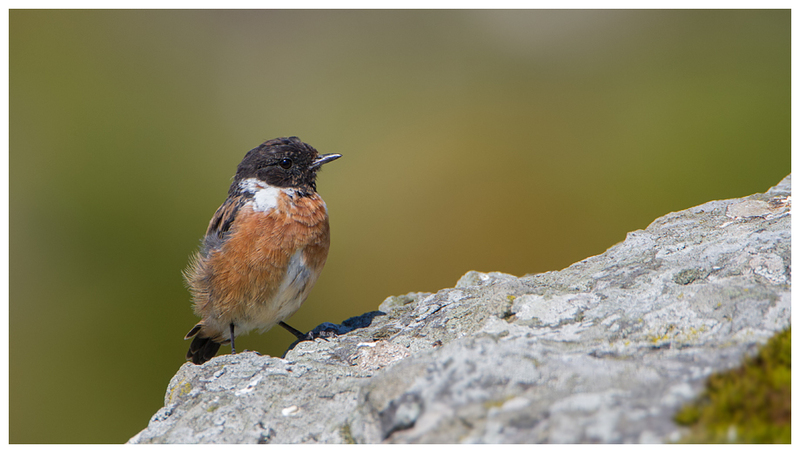 If there was a clump of ferns, there was a stonechat sat on it. 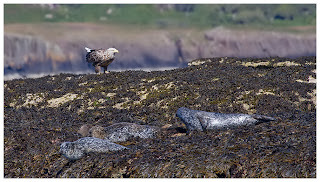 So hen harriers and otters aside, the abundance of fish in the loch, apparently shoals of mackerel had been chasing whitebait into the fresh water areas and both were drowning, meant we often saw numbers of them washed up as the tide retreated, and of course this meant the birds, such as the gulls, hooded crows and herons were enjoying a feast of free food. 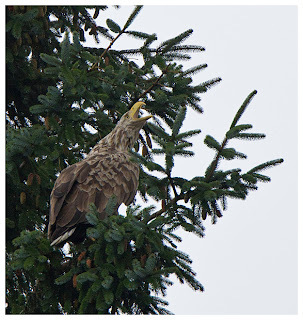 The added bonus to this though, was that sat high up in the trees watching all of this, were the local white-tailed eagles, and as soon as one of the birds dragged out something large enough to be interesting to the eagles, one would swoop down and steal it. 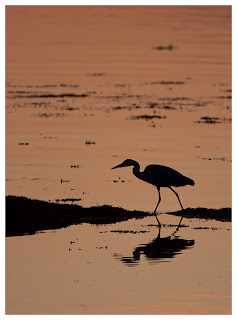 This of course was sensational to watch each morning, provided the tides were right, and I would park and wait. If the eagles were in the trees, then I'd try for shots of them perched up, or watch and wait for the eruption of gulls from the shore, a sure sign an eagle was incoming. 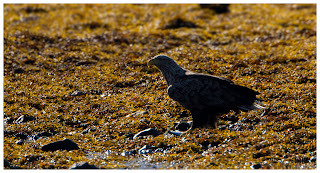 One morning, an adult WTE landed very close to the car, on the seaweed to grab a fish. Backlit, but still incredible to see so close up. And another morning, I had seen the birds go up, and back down. 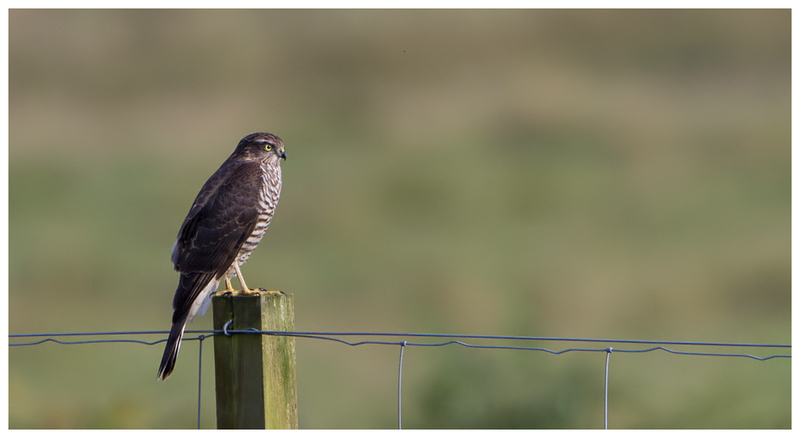 I took a look along the shore but failed to see anything, so wondered if the local sparrowhawk had spooked them. 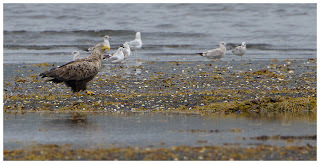 As I was about to drive off, they went up again, and I saw a juvenile WTE take off from the shore, and head along the road near me. 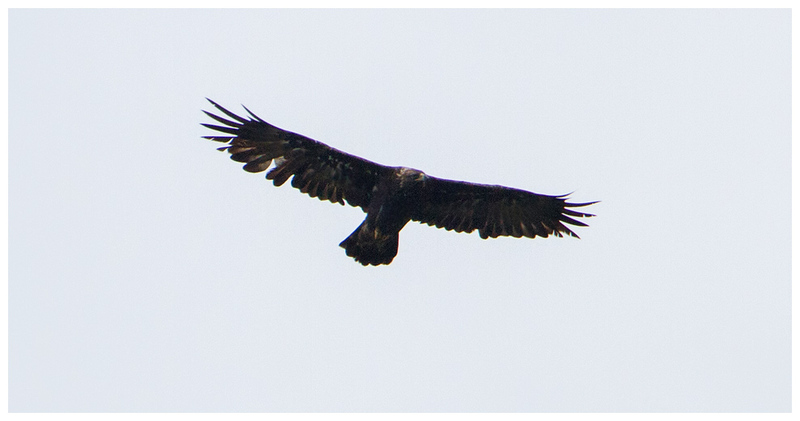 Thankfully it chose to perch up, on a ledge next to the road, and I was able to pull up in a spot and get some wonderful shots. 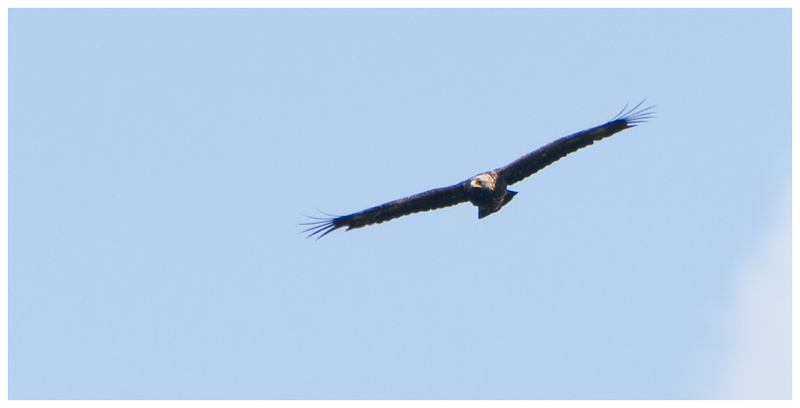 It would have been some sight to the farm-worker who drove by (if he saw it) on his quad bike, the noise of which sadly scared the eagle enough for it to fly higher up into the trees, but not before I had taken a selection of images, showing just how huge the wings are on these monstrous birds. 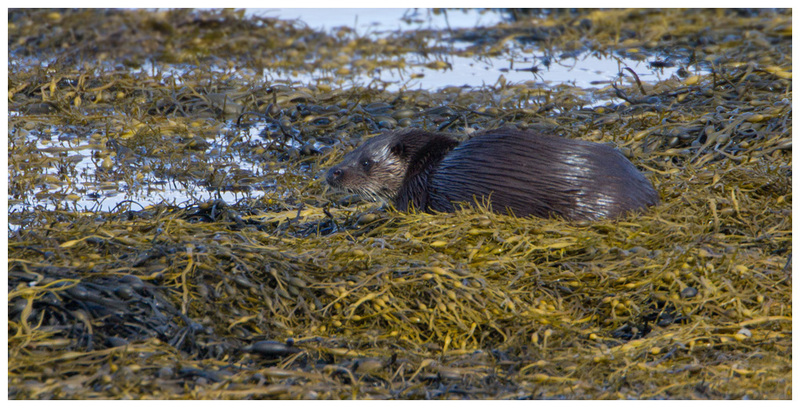 It only took a couple of days for me to catch up with an otter though, and I managed to get some reasonable shots as it preened on a bed of seaweed. But that was pretty much it, aside from a few distant views until later in the break. 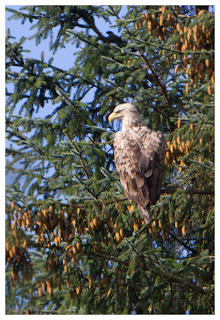 The white-tailed eagles however were proving to be fantastic to watch, and after working out where one of them liked to perch up, I prepared by working out where I could get a decent view of it from, without being too close (not much need with such a big subject and 700mm reach) or too low below it. I just needed some sunshine, which was a little annoying as the first 5 days of the break had been unusually sunny! 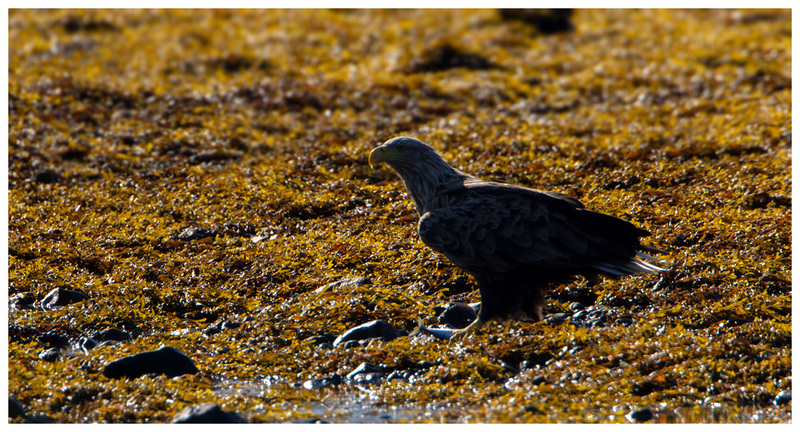 Watching the eagles feed from the shore provided not only entertainment but also some different sorts of shot to normal. 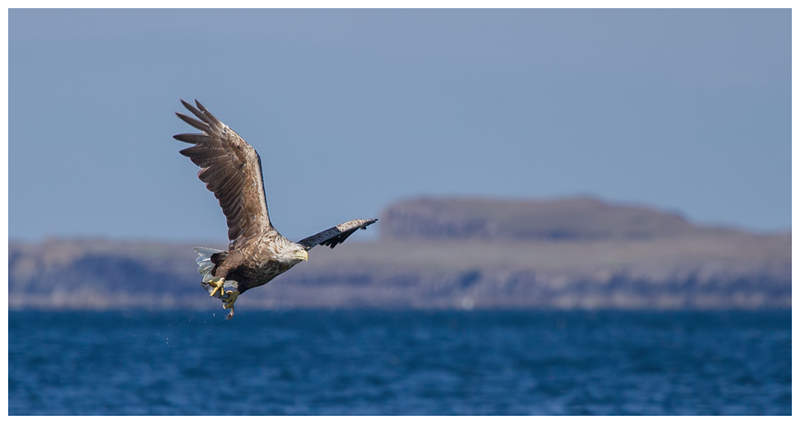 That said, when they headed back to the trees to eat the "catch", the images really resembled those taken from the Mull Charters trips. Speaking of which... I'm sure anyone who reads these blog posts or knows me, realises how much I love going out aboard the Lady Jayne, and with 2 weeks on Mull I booked 2 trips. The first was actually postponed due to gales being forecast and sure enough it was very gusty that day, but sunny. Thankfully the sun remained and our first trip was a real joy. As well as the usual gannets, gulls and shags around, I was chuffed to get some images of manx shearwaters, albeit at some distance. After seeing the white-tailed eagles powering across the sea in front of us, we were in high hopes of a visit by the cliffs, but despite the offer of fish, and attendance of both gulls and gannets, no eagles materialised. Martin headed back to the loch and as we floated by the seal colonies, Martin joked to me about being used to no-shows (he almost barred me at one point after a couple of failed trips). Thankfully that must have been a coy plan, and tempted fate, as seconds later someone spotted a pair of eagles approaching high up. Fish offered, and down one came. 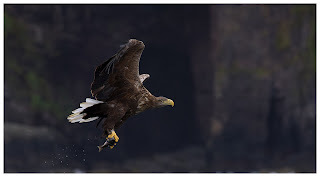 Normally when the fish is taken, the eagle departs to near their roosting site, but this one chose to fly past us, and landed on the rocks, close to some rather bemused seals. It soon tore up the fish and was off again, flying up past our boat, gaining some height, before briefly circling and departing. 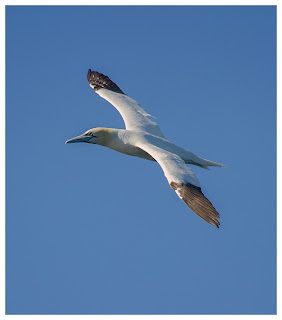 Wonderful to see against the clear blue sky. 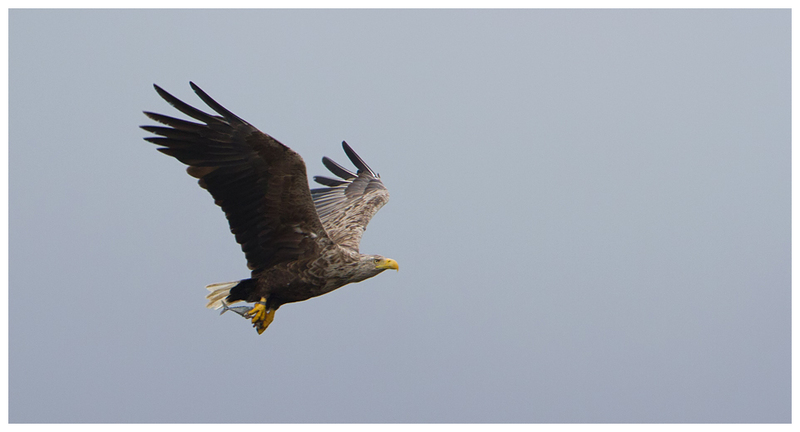 Shortly after the boat trip, we witnessed 3 juvenile WTEs circling and interacting high up over Loch Na Keal. 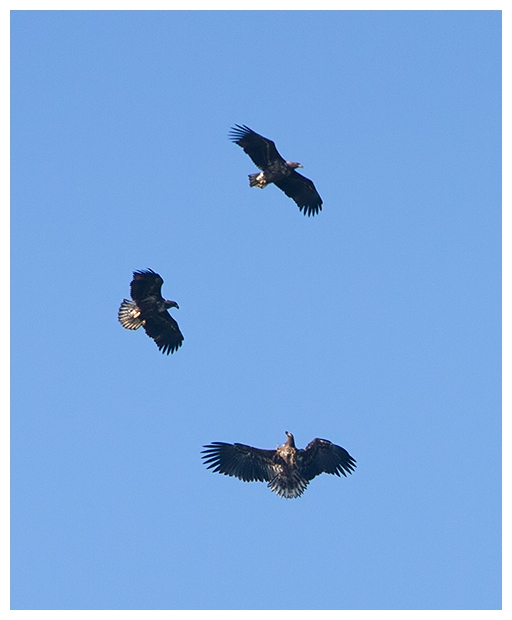 It's impressive to see one eagle, let alone 3 in the same shot. Our second trip on the Lady Jayne promised to be calm, though the skies were overcast. Unexpectedly though, once we were out of the shelter of Loch Na Keal, we realised there was quiet a swell and the boat was bobbing around like a cork. Alas there was very little around this time, but on reaching the cliffs, both adult eagles flew out to greet us. 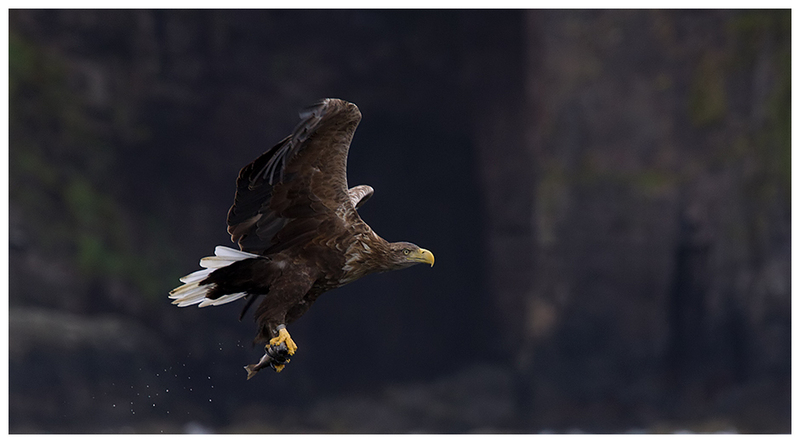 This, coupled with the overcast conditions and the boat moving around so much, made for very challenging conditions for photography. I had to reach out on a number of occasions to stop Dad falling over and tried to keep a firm grip on the rail to maintain my balance. With both eagles present, you actually needed two pairs of eyes to watch each, but I picked up on the signs that one was going for the fish and thankfully the 100-400 & 7D combo locked on in time. Being much closer to the action this time, I really needed the zoom factor of the lens, and used it to ensure the whole bird was in the frame as much as possible. And seconds after the first came down, the other swooped in for its fish. Approaching from a higher angle, I was able to get on to it slightly more easily, and tracked it in. Just before dropping down, the eagle twisted and gave me a wonderful view of the top of its wings. 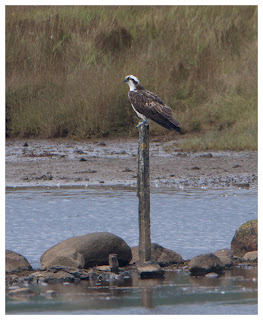 Then I managed to miss the take, as the ladder on the back of the boat got in the way! Can't have it all my own way, can I? 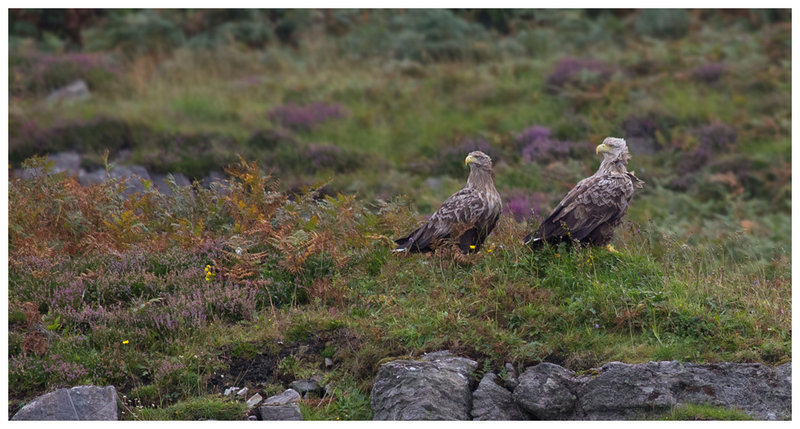 Back on the cliffs, the eagles briefly sat beside each other, and made for a rather lovely sight. 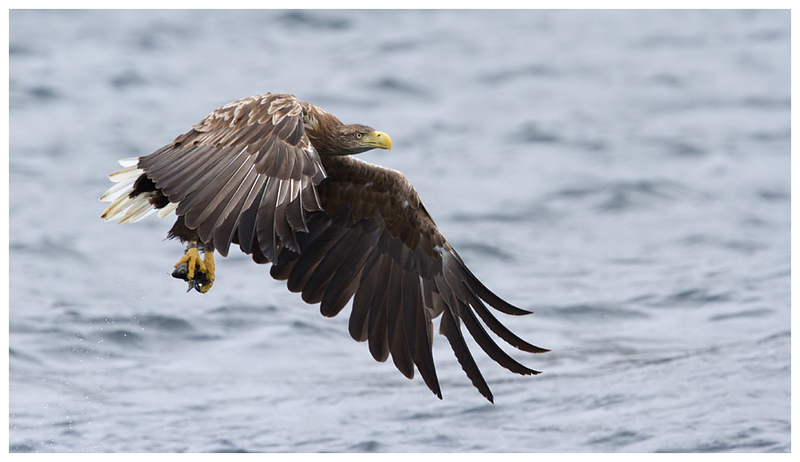 Mull was certainly providing me with opportunities for the white-tailed eagles, but what of their golden rivals? 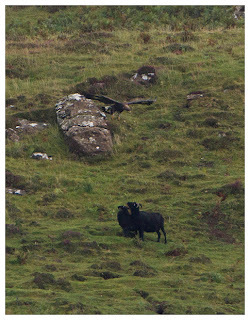 Well, we didn't seem to have too much trouble locating them on our travels around the hills, but as ever, getting them close or in good light was a different matter. I lost count of the times I drove round corners hoping to see them closer after watching them sail over a hilltop or ledge, only to find they'd vanished entirely. 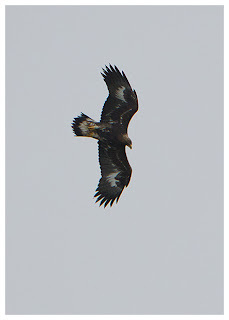 I did get some luck on one occasion, but it was so overcast and gloomy, despite the eagles being close, I could get no real detail on them. It was interesting watching them hunt though. 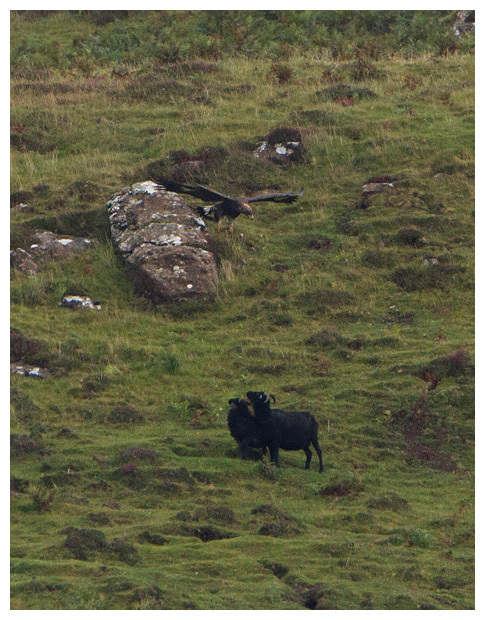 One juvenile actually hung in the air above a pair of goats (or black sheep?) for a few seconds, but quickly lost interest. 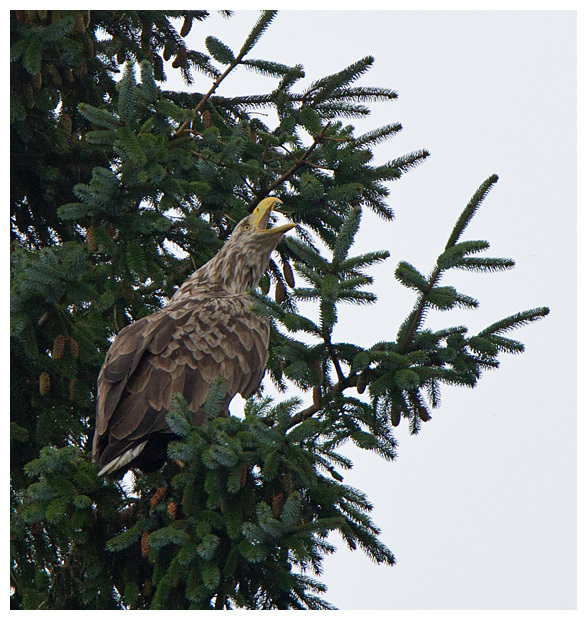 Whilst on another visit, we saw one scaring the rabbits on the hillsides, though the eagle never seemed to get close enough to take any. So what else was around during our stay? 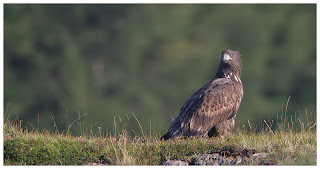 Well we saw lots of buzzards, heard and occasionally saw red-throated divers on the loch, masses of swallows, house martins, meadow pipits and pied wagtails. Huge flocks of goldfinch, linnet and I think twite on the hills between the lochs. Wheatears, siskins (on the feeders outside the cottage), hooded crows and ravens, and an osprey from the road to Grasspoint. And I eventually bagged some shots of a sparrowhawk when it kindly perched up one morning. Plus there were quite a few deer around, usually early morning or at dusk. 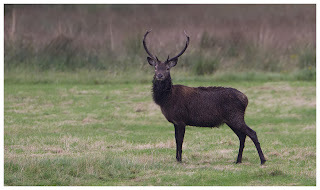 Though we did catch up with a small herd near Grasspoint one day, including a dark coloured stag. 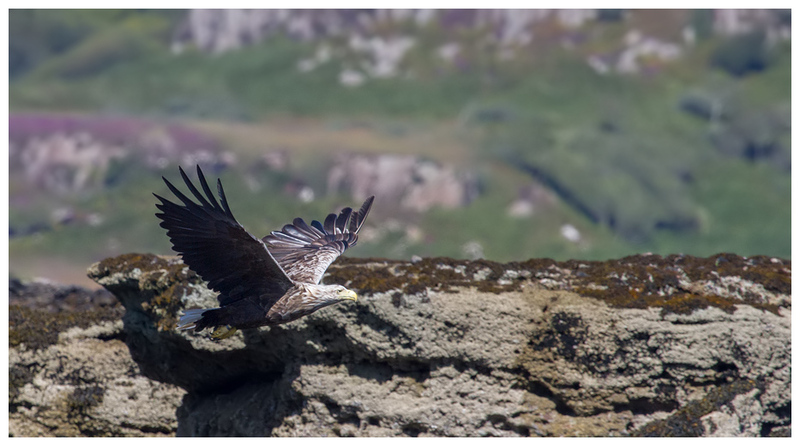 When the fine weather was upon us, I tried to get some more scenic shots, which will appear on my website eventually. 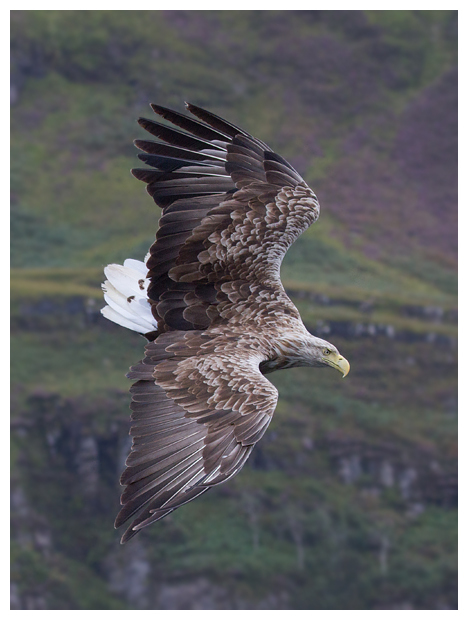 But what of the Mull Magic? 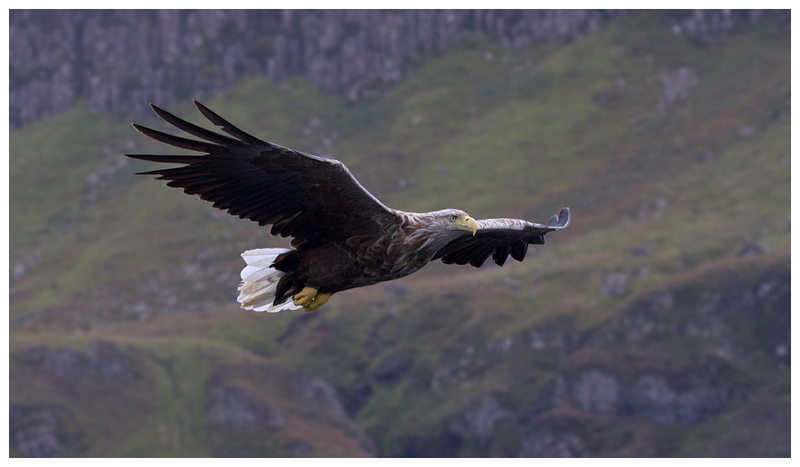 To be honest the entire fortnight was magical, but aside from the boat trips, a few moments stood out. 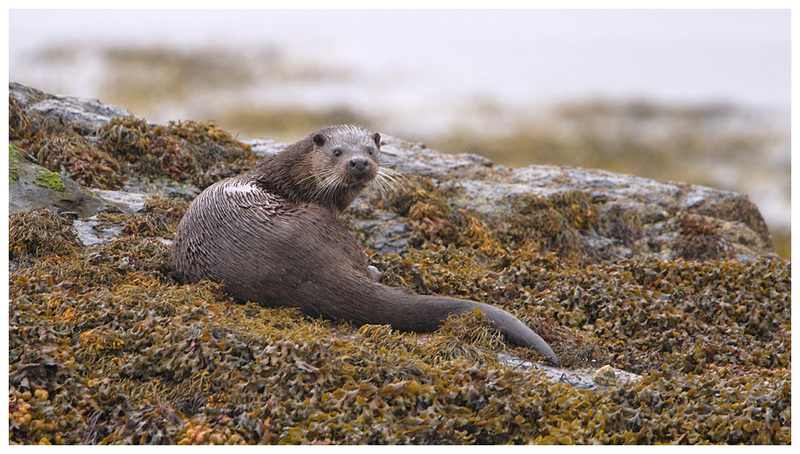 During the first week, as we were watching the sun go down over the loch and hills beyond, I spotted an otter fishing near the shore. 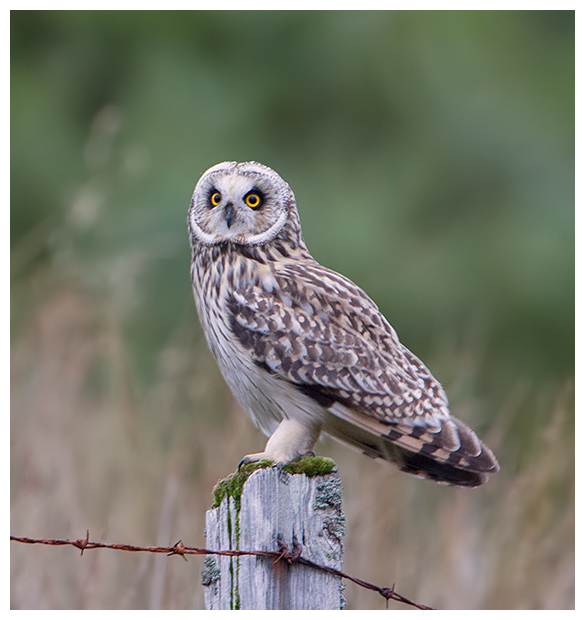 I went to the fence to watch a bit more closely, as did one of the guests of the hotel. 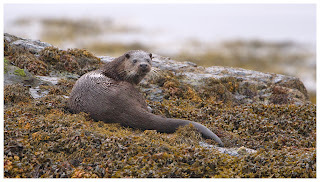 Soon we were joined by the couple who share our love of the Isle and are usually around for one of our weeks, and we watched the otter diving and surfacing for a good half an hour. 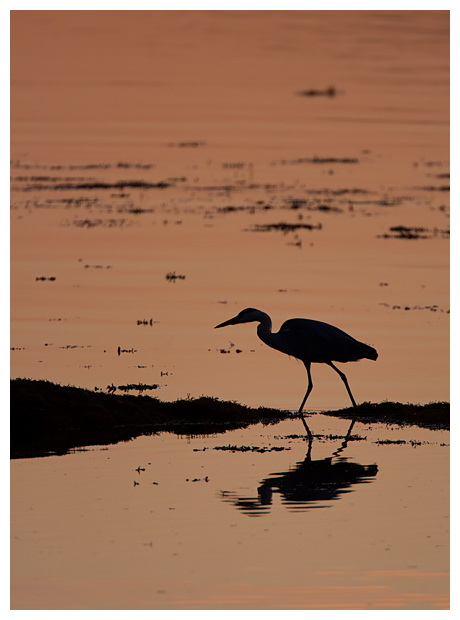 It was almost completely dark when we lost sight of it, but with the calmness and quiet of the evening, we could hear it crunching through the food it had caught, and exhaling as it surfaced. 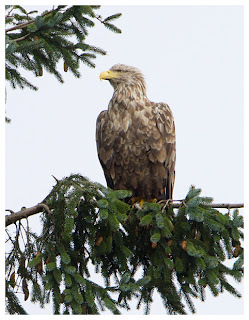 One morning, as usual I was walking to my car from the cottage, and spotted something in the water near the shore of the loch. Another otter, and this time the light was there for photos, just about. 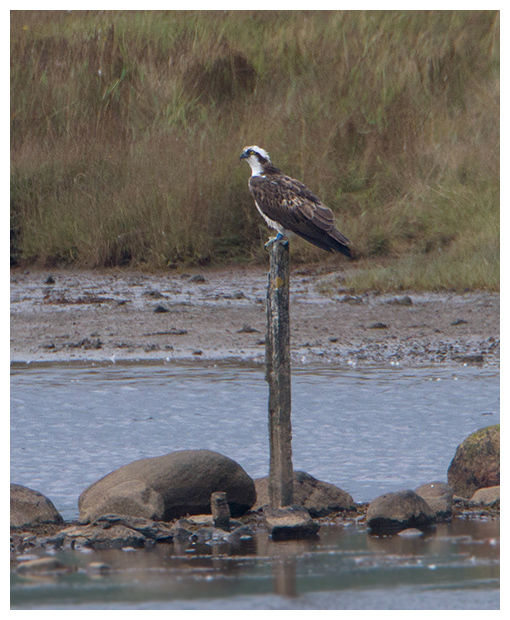 I opted to track it along the side of the loch, playing statues when it surfaced and moving when it dived. 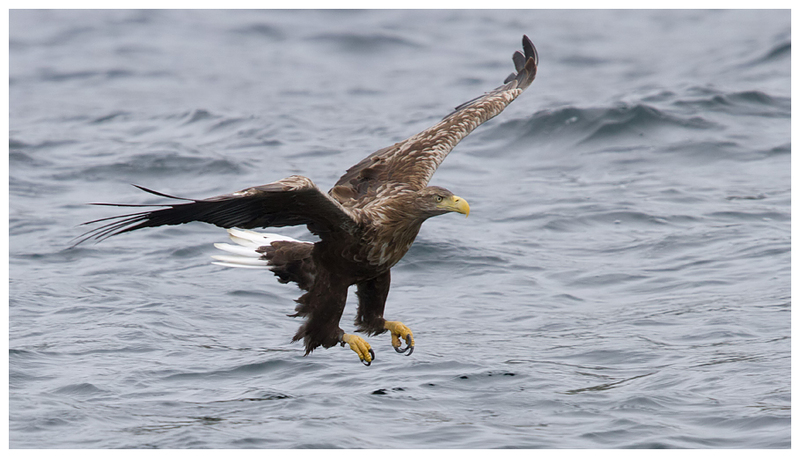 I also stayed down wind from it and was eventually rewarded when it came ashore. Once they have finished fishing, they take on a different attitude, and while still diving occasionally, they make a more direct line to where they plan to leave the water to their holt. I clocked this and guessed where it was aiming for. Crouching down amongst the boulders on the edge of the shore, I waited. 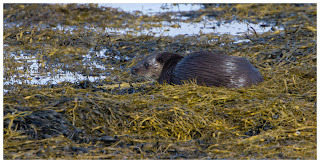 The otter appeared closer than I had expected and with the silence of the morning, I didn't dare fire off any shots in case I spooked it. Besides it was so close I'd only get a head shot. 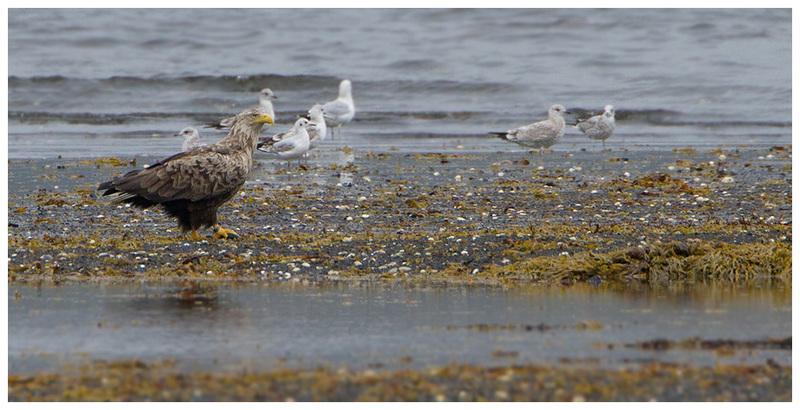 Then it scrambled into the rocks maybe 30 feet from me, and vanished. That was that, so I thought, and stood up, stepping backwards on to the road. Then it reappeared. Less than 20 feet from me, on the road. I stood frozen. It looked at me, then took a few steps forwards, stopped and looked at me again. I only moved my eyes to watch it. Then it just casually strolled across the road and off into the woods behind, leaving me with a huge smile. 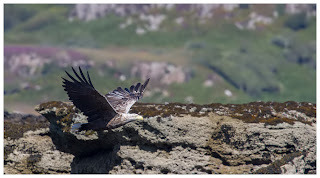 And last, but not least, on the drive back from the pub in Craignure one evening, as we headed through the glen, with it getting pretty dark from the shade from Ben More, Dad quipped about us possibly seeing the hen harrier we had seen occasionally in the area before. Then we saw them. 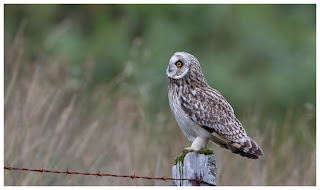 Sat on posts next to one another, beside the road were a ringtail hen harrier and a short-eared owl! Coasting to a stop I prayed they wouldn't be scared off. 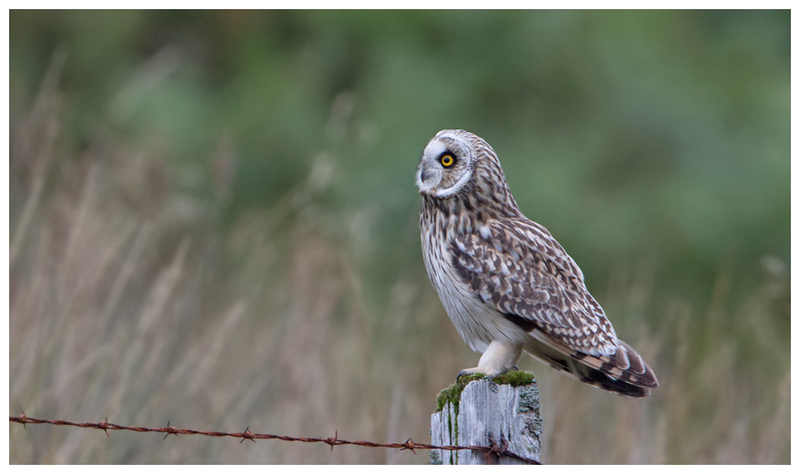 The hen harrier hadn't read the script and took flight, but the owl sat still, long enough for me to grab a few shots at ISO 1000 and about 1/30th sec. 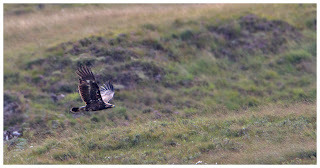 Then before Dad could consider trying for a shot, the shortie too, departed. Needless to say we tried the same spot at the same time on evenings after, but only once did I even see the owl, and then it was much further up the hillside.